Over time classical music has shifted from being a lean forward activity, where the emphasis is on participation, to a lean back activity, where the audience are passive observers. Music originated as a lean forward activity in churches. The chorales in the Bach Passions are a brilliant use of lean forward music, and Britten followed Bach's example with the congregational singing in Noye's Fludde and Saint Nicholas. The flourishing community choir movement in France is a testament to the power of lean forward music. Music lessons in schools, now fast disappearing, are lean forward music pure and simple. John Cage wrote his A House Full of Music (described by him as 'A Musicircus of non-professional music') for 800 music-school pupils in Bremen, Germany, and his 4' 33", where ambient sound becomes the performance, is the ultimate lean forward music. Whatever else the YouTube Symphony was, it was fantastically exciting for its performers, who were plucked from their daily lives and treated like star musicians for a few days. Clive Gillinson, Carnegie Hall's Executive Director, put it well at a press conference on Tuesday, saying that today the level of music-making is higher than it's ever been, but that classical music itself is less important to most people's lives. "We have to invert that pyramid," he said - speaking, rather poignantly, to a group of journalists who, to judge by their questions, did indeed see classical music as an exotic phenomenon. An important new example of 'inverting the pyramid' is seen in my header photo. The Mantra Mountain Project is making CDs of popular Tibetan mantras available so that Westerners can learn them and chant them. The chants are led by a former chant master of the famous Drepung Loseling Monastery in south India. Accompanying him are flute, cello and other Western instruments and a choir of Tibetan and western voices singing antiphonally. The first beautifully packaged CD comes with an explanation and translation of the chants, together with large format sheet music for voice, piano and guitar, as seen below. When we listen to chanting, we receive the blessings or commit good karma. However, if we, ourself, join into it, it will be more helpful and beneficial. So it's not just listening, but you can chant with it. So that's why we have the music notation. So you can look at the notation, read it, and then play the music or chant with it. The first Mantra Mountain CD has been realised by Lyle Sanford, who as a registered music therapist working in rural Virginia knows a thing or two about the power of lean forward music. Lyle has done a superb job of arranging and producing the CD, and also contributes to the exemplary documentation. Further CDs and scores offering various transpositions of the chants are planned. 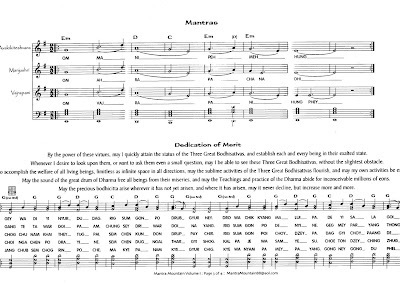 Mantra Mountain, complete with sheet music, is available from CD Baby. 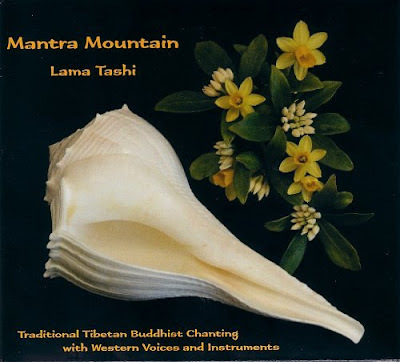 And before dismissing this project as a whacky post-hippie indulgence remember that Lama Tashi's Tibetan Master Chants CD was, as reported here, short-listed for a Grammy in 2006. The YouTube Symphony Orchestra has a way to go yet. More on the musical middle way here. Great blog post! Lean forward/back=great way to describe the shift in music. I look forward to diving deeper into the links you provide here as well as I am an 'amateur Buddhist scholar' but teaching music is my profession. Pliable - Thank you so much for this wonderful piece. You catch what it is we are trying to do, and your writing about it puts it in context in a way I hadn't fully appreciated. As a music therapist I try to engage, connect, or "get traction" with a client, because without that nothing much will be happening. Your "lean forward/lean back" descriptor is a great bit of shorthand for that. What I particularly like about it is that, to me, music has a lot to do with physical gestures creating sounds which then induce emotional responses in the audience, and "lean forward/lean back" is a physical correlate to that response. Along with everything else, you also picked up on how the packaging of the CD is done to be as helpful as possible. So often CD packaging is hard to read and use, and the same goes for a lot of music instructional materials as well. The music is the main thing, and everything ancillary to that should make the music more accessible rather than less. Since this is the first time most, if not all, of this music has been transcribed into Western notation, each CD is something of a seed of traditional Tibetan prayer music ready to be planted in new terrain. Thanks very much for letting followers of On An Overgrown Path know it's out there. I am the flutist on Lyle's CD. I enjoyed reading your review. It helps me to see the work in a broader context. It was certainly a wonderful experience putting it together, watching it grow from rehearsal to rehearsal. We were just feeling our way along and are thrilled with the way it turned out. Thanks for another really interesting chant post. Thought I'd add what I have just discovered from the world of Gregorian chant: having until recently successfully resisted the smash hit of the last few months (Chant: Music For Paradise) I found the latest edition just so lovely to look at I committed to buying it. And it's great (although Universal don't seem to care - this particular release, about the size of a DVD box, is in the shops but nowhere listed on the company website www.chantmusicforparadise). The monk's voices are young and virile, which makes a huge difference to the experience, as does the high quality of the recording. This is not repeat not the usual pensioner monks recorded with a stereo pair at the back of some church: the intense sound is so involving I now completely understand why this has been such a big seller. BTW it happens that there is a book (not booklet) bound in with this edition which I really liked as well, but writings by monks are probably off topic. Anyway, hope I can encourage the wary (you?) to try this. Something which has been at the top of the classic charts hardly counts as a "discovery" - but it has been for me. Email received:I liked the gentle physical cleverness of the distinction between lean-to and lean-back music. The downfall of the privileged position of classical music has been a sad truth for many people like me, and I have had to learn to live with the marketing factoid that only 3% of Americans love the genre. That sadness underlies some of the energy of the article. Let it be, but let it go. As for the joys of participatory music in whatever form, anyone who has sung in a choir, played an instrument, or held down a part of any sized musical grouping knows the sheer joy of making music, trying to make it well, and learning to serve something larger than the ego by making beauty with others. Unfortunately, for many of us we are in the working stage of our lives, a stage in which the ethereal joys of music-making have to take a lower place. But the article points out where many millions might look in retirement to avoid depression. Thanks for good words about that most excellent gift- music!